WELCOME TO MODERN EYECARE CENTER! We, at Modern Eyecare Center, are proud to provide comprehensive eyecare to the Spring Hill area. Dr. David McAfee and his staff are dedicated to delivering this care with uncompromised service and state-of-the-art technology. Modern Eyecare Center was founded on the premise of offering all levels of eye care service to meet your family's needs in one place: comprehensive eye exams, designer eyeglasses, latest contact lens designs, in-office lab for same day service on most single vision prescriptions, premium sunglasses, lasik and cataract evaluations, and technology to monitor and treat medical eye conditions. As an optometrist in the Middle Tennessee area for over 11 years, Dr. McAfee brings both his experience and compassion to every eye exam. 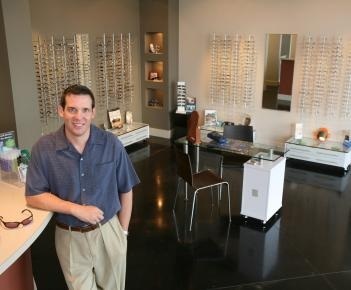 Whether you live or work in Spring Hill, Franklin, Columbia, Thompsons Station, Brentwood, Nashville, Lewisburg, Lawrenceburg, Chapel Hill or the surrounding communities, we invite you to visit our modern facility for your vision needs.